Getting From "Me" to "We"
Free Download: Getting From "Me" to "We"
We're the Retail Consolidation specialists. 1. Retail Consolidation Benefits: How KANE's retail consolidation process can cut your logistics costs by 35%. 2. 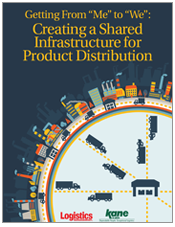 How Collaborative Distribution Works: In a collaborative distribution environment, consumer goods manufacturers share ware-house and truck capacity for products destined for the same distribution centers,so why not eliminate redundant logistics processes? 3. Benefits of KANE's Retail Consolidation Program: How KANE helped Sun-Maid reduced its outbound freight costs for its consolidated shipments by 65%.